VATICAN CITY (CNS) -- The Vatican said comments attributed to Pope Francis denying the existence of hell are a product of an Italian journalist's "reconstruction" of the pope's remarks and not a faithful transcript of the pope's real words. Eugenio Scalfari, a co-founder and former editor of La Repubblica, an Italian daily, said Pope Francis -- with whom he has had several telephone conversations and face-to-face meetings -- invited him to his residence March 27. During their conversation, Scalfari, 93, an avowed atheist, claims the pope said that while the souls of repentant sinners "receive the forgiveness of God and go among the line of souls who contemplate him, the souls of those who are unrepentant, and thus cannot be forgiven, disappear." "Hell does not exist, the disappearance of sinful souls exists," Scalfari claims the pope said in the interview published March 29. The Italian journalist has explained on more than one occasion that he does not take notes or record his conversations with the pope; he re-creates them afterward from memory, including the material he puts in quotation marks. The Italian journalist has explained on more than one occasion that he does not take notes or record his conversations with the pope. The Vatican issued a statement soon after the article was published, saying the pope did receive Scalfari "in a private meeting" to exchange Easter greetings, but he did not "give him an interview." Regarding the alleged words of the pope, which were also published in a similar article written by the journalist in 2014, the Vatican said Scalfari's article "is a product of his own reconstruction in which the actual words pronounced by the pope are not cited." "No quotes of the aforementioned article should therefore be considered as a faithful transcription of the Holy Father's words," the Vatican said. According to the Catechism of the Catholic Church, "immediately after death, the souls of those who die in a state of mortal sin descend into hell, where they suffer the punishments of hell, 'eternal fire.'" "The chief punishment of hell is eternal separation from God, in whom alone man can possess the life and happiness for which he was created and for which he longs," the catechism says. According to the Catechism of the Catholic Church, "the souls of those who die in a state of mortal sin descend into hell." The alleged quotes ascribed to Pope Francis directly contradict the many public remarks he has made in homilies and speeches confirming the existence of hell. Meeting a group of children and teens during a Rome parish visit March 8, 2015, a female Scout asked the pope, "If God forgives everybody, why does hell exist?" The pope praised the question, saying it was "very important" as well as "a good and difficult question." The pope assured the children that God is good but reminded them that there was also a "very proud angel, very proud, very intelligent, and he was envious of God. Do you understand? He was envious of God. He wanted God's place. And God wanted to forgive him, but he said, 'I don't need your forgiveness. I am good enough!'" "This is hell: It is telling God, 'You take care of yourself because I'll take care of myself.' They don't send you to hell, you go there because you choose to be there. Hell is wanting to be distant from God because I do not want God's love. This is hell. Do you understand?" On other occasions, the pope has described hell as the destination for those who choose to continue to sin and do evil. Speaking to families of victims of the Mafia March 21, 2014, the pope made an appeal to all men and women in the Mafia to stop, turn their lives around and convert. "Convert, there is still time for not ending up in hell. It is what is waiting for you if you continue on this path," the pope said. I feel the existence of hell is inconsistent with who God is. An earthy father condemning his children to eternal fire for disobedience would quickly find himself in jail. Agree. Though that does not rule out people creating a hell for themselves while they are alive. Hell’s existence is not out of the question, just certain definitions of hell. Scalfari, 93, an avowed atheist. So some people would actually believe this atheist. I am sure a lie to him is meaningless. I guess these are the people who would also believe the anti Christ. Shameful. I wish the Pope hadn't invited him but I am sure the Pope is just imitating the love and mercy of Christ. Shameful Mr. Scalfari. But Christ didn't allow Himself to made a tool of the pharisees. Naivety is not love and mercy. Because a person is an atheist it's a given that s/he would lie? What total nonsense. the final misuse of our freedom to will. when he is discussing theology. How this will be played out - who can say. Frankly I am more scandalised by the "Chewy Advertisement"
that has a puppy made out like a Bishop. It makes perfect sense when you're the world's greatest narcissist who makes up and remakes the Catholic religion as he goes along just to hear himself impress the invincibly gullible and to think of himself as the fulfillment of his own invented God of surprises. Once you toss out the anointed Pope, is one still a Catholic? There is nothing in what you quote that precludes his being wrong or a prideful conceited buffoon in need of correction, especially since this particular pope has revealed himself to be a process theologian, someone who believes God is imperfect and in the process of learning how to be a good God over time and in need of instruction from His own creation. But even that lawfull "unhindered" exercise of power does not include contradicting the Deposit of Faith. You can find the existence of Hell in the same Cathecism. It's not hard to be more Catholic than an Orwellian pope who doesn't understand that Jesus affirmed the immutable truth of moral law against the cultural and ritual accretions of the Pharisees. Francis' theology has it backwards. He constantly rants against those he calls Pharisees for seeking to preserve moral truth against the spirit of the age which he, in his many heresies, seeks to accommodate, including his accommodations of some of the world's most vicious mass murdering abortionists. Are Scripture and the Cathecism of the Catholic Church not Catholic enough for you, Philip? The 93 year old atheist- whatever his chat with the Pope actually involved-seems to have heard what he wanted to hear. The idea that men have no immortal soul, and that the unrepentant just "disappear" after dying, seems a common conviction among atheists- two people in my family cleave to that notion like dogma. The most convinced 'non-believers' I have met over the decades, have very concrete convictions about what happens after death: nothing! Game over, nothing to see here. It's comforting to people who don't know God (or who do, but are estranged from, and have rejected him) to just erase the possibility they might run into him someday. It never seems to phase them much that their beliefs about the next world are also faith-based. There is no Hell,homosexuals are not sinners,Jesus is not God... Long live new Catholicism! Something important is missing. Is the report simply that the headline is unreliable or that the Pope said there is no hell. All else is clickbait. What a headline! 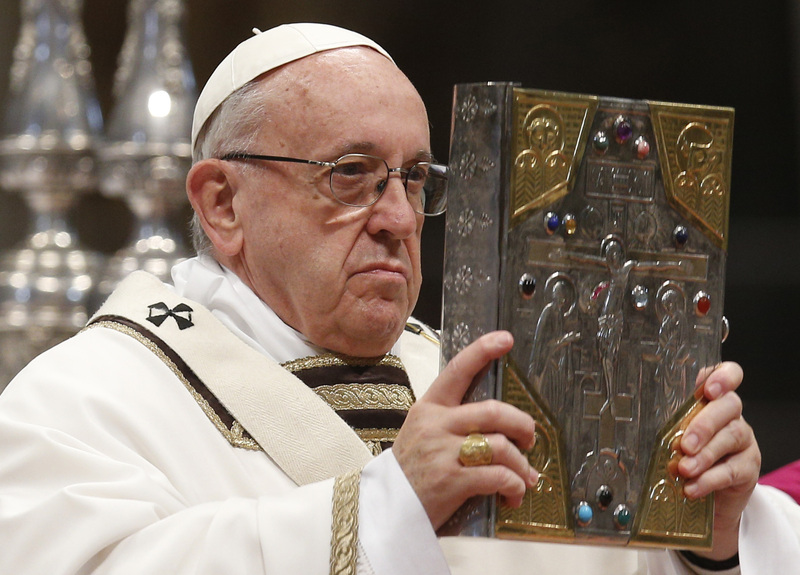 "unreliable" is definitely not the right word, unless one is trying to leave the door open for Pope Francis to contradict Scripture and the Catechism. In any case, another highly imprudent action by the Holy Father in letting this situation happen. He should spend less time hobnobbing with this 93-year old atheist confabulist Scalfari, and more time with the 90-year old Pope Emeritus, who seems intellectually strong as ever. So the NY Times had an interesting article about this “mountain from a molehill,” describing Mr. Scalfari and his penchant for reconstructing chats and conversations with Francis. Francis can meet and talk with whomever he likes. Francis is sophisticated enough that he can put up with misstatements because that is the province of anyone in high places (except perhaps Trump who deliberately misstates because he knows nothing – political opinion my own LOL). What I like about what Francis says about “hell” is his description of people who deliberately say and act to separate themselves from God. That is their “hell” made even here on earth, which may have been Francis’ way of making Mr. Scalfari rethink his atheism? Sure hope this news bomb is the product of faulty reconstruction of a conversation due to senile dementia or a blatant desire to deceive on the part of Scalfari. The Pope can't contradict Scripture, Cathecism and Tradition. A reminder to keep the Pope and bishops in our daily prayers so they are apostles of Truth. Doesn't Scripture say that Hell was created for Lucifer and his band of rebellious angels. not for man? Didn't Jesus speaking of Hell call it "Everlasting Death?" Based on Jesus' words I tend to believe that those who die in a state of total aversion of God, call it "mortal sin" remain everlastingly dead and for them as a result no resurrection from the dead. For me that's Hell! Interestingly I think it was Scotus, or maybe Bonaventure, speculating theologically on the creation of Hell by God, suggested that the creation of Hell by God for the Fallen Angels was an act of Mercy on God's part, as it would have been a greater Hell for the Angels to remain in the presence of God than t o be "cast out." after the total rejection of Him. So God's Mercy being above all His works as Scripture reminds, cast them out! This is easy for humans to understand, as we too cast out people who 9ffend us, disgust us, saying, "I can't stand being in his/her sight!" But as God does, we do not act out of mercy, but from selfishness. I believe what St. John Paul 11 said; that hell may be empty of people. To be eternally separated from God, one has to choose to do evil, knowing it is evil , and knowing that God is good, and God loves you. One has to choose to do evil, not as a means to an end, but for the sole purpose of wanting to go against God who one knows to be good and loving. One has to choose to do evil not lacking in faith in the goodness of God, but as Satan and the devils do; as a deliberate desire to defy God who they know is good. It's not easy for a human being to be damned. Even Satan and the devils have free will to repent. What is shocking is if the pope believes that God annililates those who die in moratl sin. That would make God less then all good and all loving.For to create us in his image and likeness, only to destroy us, makes God's love conditional. Conditional love is a diminishment of being, and if God's being is lacking in love, then being itself is not essentially good. The nihilists would be right[lol]. I don't believe the Pope said this or believes this. The idea of annililation of humans, is horrific. To create only to destroy would make God lacking in love . If Jesus is the mediator of fallen humanity with an all good God, then annihilation of those he loves, is anathema to God. Purgatory; the souls' coming to true repentance for ones wrong doing, through the experience of what is bad and wrong[suffering], befits the human condtion, but annilation makes no sense from a Christ centered theology. God loves the world, God saves the world, only to destroy some beloved souls? Such a belief is not Christian. God loves the sinner, not the sin; humans do not will to defy God and do evil knowing God. Even Satan and the devils, who HAVE deliberately chosen to defy the God they know is love, have not been annihilated. God is not Shiva, and Pope Francis is not a Hindu. [ Perhaps this reporter is putting this out as propaganda ; if even God destroys people labeled evil, we righteous humans can do the same here on earth].